So I think earthquakes are becoming a normal thing here in Mexico. They usually hit during the mornings but one grabbed us in the middle of the night and my companion woke up and told me ^Oh my gosh, we`re having an earthquake^....and I just sort of sat up and waited for it to stop and told her ^I`m going to the bathroom^ haha! I didn`t realize that she`d get mad at me, but it was mostly just funny the next morning when we talked about it...I think she wanted me to protect her a little bit more. My companion and I are definitely super different people. She is afraid of everything. From dogs, to soccer balls, food that`s too spicy to storms...it`s interesting for sure. I`ve never been too afraid of anything and I think I^ve become even more immune to everything haha I try to be really nice about all of her fears but when she`s afraid to walk down a street because some kids are playing soccer I`m just like no...we get along great, but it`s because we work on it and we don`t get mad at the dumb stuff. We have an interesting investigator. He`s a philosopher and he wants to believe in Christ but all of his previous knowledge about science is really fighting against him. He`s really awesome too because he asks legit questions and reads and wants to go to church even though he hasn`t been in 40 years. We first met him 3 weeks ago when he asked us if we had any books that we could give him. haha! Heckka yea we have some books if you want them! He`s really nice (he invited us over with his family to eat Postole) and his family was even nicer. Whenever he`s not there , they`re always telling us ^Please don`t leave him! ^haha! We`re going to have the zone conference this Thursday at last, it`s dragged on for way too long, I`m happy to finally get it over with, haha! It was cancelled last week because the President got stuck in this horrible traffic jam that wasn`t going anywhere. I gave a talk in church yesterday about blessings and the privileges of being members of the church and how we should live up to our potential and enjoy life because life is meant to be enjoyed. Today I met up with a friend from Michigan who lives here in Cuernavaca (my companion and I had to come to the capital to fix up some of her visa papers) and we both really have grown to appreciate the United States and all the awesome things that there are that we will never again take for grated. I love my country! So the training never happened, haha! My companion was really relieved! We were all ready to go and so were all the other 30 missionaries! We were waiting for the President and his wife to come and we were probably waiting for 2 hours...they eventually gave us food and told us that the zone conference would be postponed because of traffic. I´m still not really sure what happened but it must have been bad or impossible for him to arrive because this is the first time a zone conference has been cancelled! So we´ve had some interesting experiences happen this week....2 Weeks ago we were lost in the street....not surprising though, I always get lost haha! and we asked a man for directions...and it just so happens that 13 years ago some missionaries had passed by his house! We set up an appointment, went and ....he wasnt there...so we left a note with our number....and a week later he called us and we went to visit him! We shared the first lesson and he started to cry and told us that it was time for him to join the true church...he went over to his bookshelf and took down the copy of the Book of Mormon that the Elders who had passed by his house 13 years ago had left him....he brushed it off and brought it over to the table. I was amazing, almost shocked. His man had known that this book must have had some worth because for 13 years he had kept it... It´s for miracles like this that I am so grateful to call myself a member of The Church of Jesus Christ of Latter-Day Saints. Also there´s this 100 year old lady that we teach, ¨Gertrudis.¨ We were walking down her street and we saw her trying to open her front gate...and my first thought was ¨Heckka no, whatcha doing Gertrudis, get back in your house! ¨ This lady is the sweetest thing but she´s stubborn! Apparently she had run out of medicine, so we helped her look for it and we couldnt find it so we kept calling her son and eventually he came to help us find them, but I think about how the Lord just knows....He knows...If we hadnt have been there in that moment she probably would have been ran over or something! Mexican drivers are something else! But really, I´m just so grateful to be here representing something that´s so much grater than I´ll ever be. I love the gospel. I hope you have an excellent week! This week has been great. My new companion is really nice and we´re working hard in our area. She´s had a really hard time adjusting to mission life but that´s okay, we´re working it out. It can be a little hard at first because some people always are thinking about their families and I´m really glad I have the opportunity to train her because it´s given me some really great teaching opportunities. I really love her and I want her to have all the success possible in the mission. She literally relies so much on me and she´s always asking me advice and for tips and I´m all like ¨whoa, you´ve already fought half the battle because you speak Spanish! ¨ It really makes me rethink everything I believe and why I believe it because sometimes she asks me the deepest questions that she´s been struggling with and it really makes me think! But I´m so grateful that she has this trust in me and in my abilities.But I´m just really trying to keep her spirits up and be a good example for her. We received a call from our zone leader yesterday and he had some interesting news for us. Apparently the President of the Mission is coming in 12 days to give us a training lesson. His 2 assistants are also going to address the zone (there are 28 of us) and apparently my companion and I are also going to be giving a lesson of 45 minutes! Ha! We´re going to teaching everyone why the Book of Mormon is so important in the conversion of new investigators. This should be really interesting. We have sister training leaders in our zone and apparently theyre not going to be training us, but my companion (who literally just finished her first week) and I will be training...uhhh...If you could all shoot some prayers my way that would be spectacular. I´m really glad that I have this opportunity to share what I believe infront of everyone, but more than anything I was a little suprised! haha! There is this one lady in our area who is amazing....we´ll theyre all amazing, but this one in particular. Her name is Gertrudis and she´s 100! whoa! she lives alone and she loves when we visit her. We always sing her hymns and she always wants us to sing ¨How Great Thou Art¨ and weepy Sister Ward fights through it everytime. I love just sitting on her bed with her and talking. She really is special. Also there is this lady who has been to church twice but stopped going because the friend she went with moved. She is super busy working, trying to support her family and has little time to spare. Last week we went over and helped her clean her refrigerator and we gained some of her trust. She is such a hard worker and she really is amazing. We went back to help her cut some onions 4 days ago and we were there for like an hour! My hands still smell a little bit like onions....yeah. But it was worth it! I hope she goes to church! haha! Sunday I get to talk to my family on Skype! Woohoo! I love you mom! Happy Mother´s day a little bit early to all the amazing moms out there! 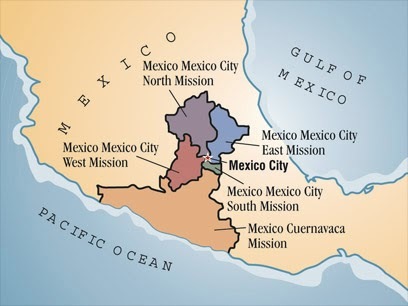 This week has really been an interesting one (I´m pretty sure that´s how all my blog entries start out....anyways.. we had a district meeting on Monday night and one of the sets of sister missionaries brought a 14 year old girl with them that reminded me exactly of my sister. Exactly. It was scary. We acted, dressed, talked, everything possibly imaginable, she did it like my sister...just in Mexican form, haha! We did this role play activity (we do a lot of those...they´re alright) and I just started telling the girl about stuff that was gospel related but had nothing to do with the topic, it was such a spiritual experience. The girl hadnt´t accepted a baptismal date at this point but after basically pouring out my heart and soul to this strange little girl, who probably thought I was insane, she accepted a date to get baptized and not just in our role play, but in real life. She´s getting baptized in 2 weeks. I offically have 6 months in the mission and the time has literally flown by. I only have 1 year left to be a missionary and when I get home I know I can still share what I believe, but it definitely won´t be the same. One thing I´ve learned how to do with all my companions (and it´s not something that I like to do but it´s gotta happen) is talk about how we feel....ugh...not comfortable sometimes-- But I learned how to do this with a few of my companions . I understand that people get frustrated and mad, but when a missionary of 20 starts doing the silent treatment for almost a day, I´d say it´s about time to have a talk. It´s actually a delicate topic too because neither of the people actually want to talk but you know you´ve got to because if you don´t you won´t be able to work in an effective manner. All my companions have actually thanked me for being the one who says ¨alright, what´s wrong, how can I help you, let´s talk, ect. It´s definitely something I´ve learned from the mission. I can´t wait to see what else I learn in the next year! So I received a call from the assistants to the President last week and whenever we receive a call from them you know somethings up. They told me I´d be training, again! ha! So right now I´m training, my third sister missionary...and she´s from Columbia! I never thought I´d be paired up with another Columbian just because I´m pretty sure the first one didn´t like me too much, but the President thinks I can do it and I´m actually really excited to do it! She doesn´t speak any English but we´re learning from each other. Our word of the day is refrigerator, because she can´t say it in English and I prefer just to say the abbreviation of it in Spanish because it´s just a harder word for me, haha! But before we go to bed tonight we´ll both have this word down packed! I think the best moment was when she spelt door ´dor´ I literally think she´s the cutest thing! She also got really freaked out when she saw the lizard in our kitchen last night, but I just told her it was normal and not to worry about it. haha! I helped her wrap herself in her sheet in a special way so the lizard wouldnt get to her, but it was definitely hilarious. I´m really excited that i get to train her, today is her first day in the mission and it´s going to be a wild ride, but I´m excited!